Resume of Jeremy Raines, Ph.D. The folded unipole is the integration of transmission lines and linear radiators into a single electromagnetic device. The synergistic combination results in performance found neither in transmission lines alone, nor in linear radiators alone. Notably, the folded unipole can be extremely compact (e.g., 0.05 wavelength) and broadband compared with the conventional monopole antenna. The folded unipole also has application in detuning. Obstacles causing electromagnetic interference can be reconfigured as folded unipoles and rendered electronically invisible. The same principle is useful in stealth applications. 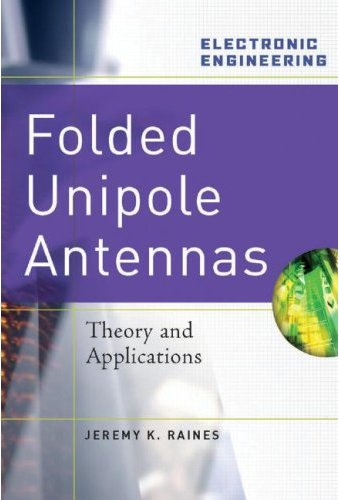 That the folded unipole actually works has been demonstrated repeatedly since circa 1947. Thousands of the most simple configurations have been constructed and deployed in the USA and around the world, mostly in the AM broadcast band. They have also been constructed for use in various military communications bands. The same design principles apply to other bands, however, spanning the electromagnetic spectrum from ELF through EHF. Countless applications of the folded unipole remain to be explored and developed, both for communications and instrumentation. A small number of theoretical analyses of specialized versions of the folded unipole have been published in technical journals; however, no comprehensive theory of the general configuration and its many applications has appeared in a single volume. This book is intended to fill that need.